Rabbit anti Bovine, Canine, Human, Mouse, Rat, Sheep IFNAR1. Phosphopeptide corresponding to amino acid residues surrounding the phospho-Ser535,539 of Human IFNAR1. Interferons are widely used therapeutic agents because of their anti tumor and antiviral effects and because of their modulatory effects on the immune system (Biron, 2001; Kirkwood, 2002). These cytokines produce their effects by binding to the Type 1 Interferon-α Receptor (IFNAR1). Down regulation of this receptor plays a key role in determining the magnitude and duration of cytokine signaling. This down regulation is thought to be influenced by phosphorylation of Serine 535 and 539 in the IFNAR1 (Kumar et al., 2003). Kumar KG, Krolewski JJ, Fuchs SY. 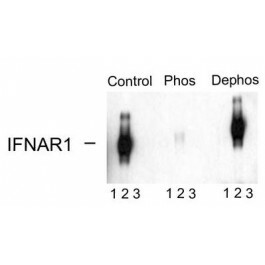 Phosphorylation and specific ubiquitin acceptor sites are required for ubiquitination and degradation of the IFNAR1 subunit of type I interferon receptor. J Biol Chem. 2004 Nov 5;279(45):46614-20. Epub 2004 Aug 26. PubMed PMID: 15337770. Biron CA. Interferons alpha and beta as immune regulators--a new look. Immunity. 2001 Jun;14(6):661-4. PubMed PMID: 11420036. Kirkwood J. Cancer immunotherapy: the interferon-alpha experience. Semin Oncol. 2002 Jun;29(3 Suppl 7):18-26. PubMed PMID: 12068384. Sequential Chromatography on phospho- and dephosphopeptide affinity columns. 10 mM HEPES (pH 7.5), 150 mM NaCl, 100 µg/ml BSA and 50% Glycerol. Bovine, Canine, Human, Mouse, Sheep and non-Human Primates. 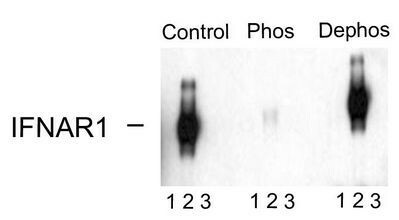 This antibody is specific for the IFNAR1 protein phosphorylated at Ser535,539. Note: The Molecular Weight of the IFNAR1 varies with cell line (different levels of glycosylation) in 293 and HeLa Cells; the mature form is ~110-130k.